Thickness Of Asphalt Driveway | How Thick Should It Be? One of the most common questions that we are asked is when it comes to paving a driveway is how thick the asphalt should be? It is an important question and there is not one quick and easy answer but instead, it depends on what surface is already in place. 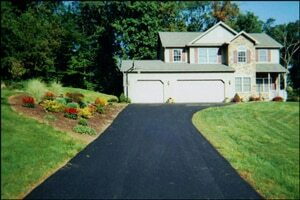 By focusing on the thickness of the asphalt driveway it can help provide longevity. This will ultimately raise the property value of a home. Let’s briefly speak on asphalt resurfacing methods. When resurfacing existing pavement the asphalt covering should be 2 inches thick. This also requires the pavement to be in good shape, relatively level and without any subsurface impediments like tree roots and this may not be able to be determined until the top layers are removed though there are usually signs that can be seen on the surface. A stone surface with a good base requires 3 inches of asphalt. This allows the asphalt to settle around the stone providing strength. If the subgrade is not stabilized properly it can lead to many serious issues and the stone sinks into the subgrade providing strength and stability but the amount of asphalt must cover these rocks up. Use this section as an asphalt thickness calculator. A newly constructed surface is done in two layers, a 2.5-inch thick binder with a 1.5-inch thick top layer. The binder provides strength, coats loose material and plugs voids. It provides a strong enough surface for heavy equipment to work on to apply the top layer. That layer is bound to the lower layer and is able to move with it making it more durable. New construction typically lasts the longest. Anything smaller than these measurements is typically considered a bad asphalt driveway. It should also be noted that thicker asphalt layers will be necessary for driveways that are used by heavier vehicles like commercial trucks, garbage trucks or heavier personal vehicles. These vehicles will cause damage to an asphalt driveway meaning it will need to be thicker to make it stronger. The thickness can be determined by the subgrade underneath and this may not always be practical. It is important to let us know beforehand so we can engineer your driveway so it will be able to stand up to this kind of traffic. With all this information you are able to judge your asphalt paving thickness. If you don’t know how to lay asphalt yourself than allow us to help. We take pride in our work, let us prove it.